During first scene when Gordon and Albert were explaining to Tammy what Blue Rose is. Not that we've got any evidence to tie the two things together, but I immediately thought about Caroline. Gordon was director of FBI at the time Blue Rose cases began, correct? He grouped Dale, Philip, Chet and Albert (interesting Denise was excluded?) to form the Blue Rose task force. The woman who said 'Blue Rose' before her death would have been related to Philip Jeffries' investigation(s) or possibly even before. I'm sure someone here can do a better job of outlining the agents/cases related to this topic. Jeffries... ? I know, we're not talking about Judy, but... is this the woman who uttered Blue Rose before her death? Desmond... disappeared from trailer park while investigating Theresa Banks' murder??? Dale Cooper... started in Twin Peaks with investigation of Laura Palmer's murder, revisited scene of Theresa Banks' murder? Albert... wonder if he was present at all the crime scenes. also, did Lil hint about Blue Rose in FWWM? Yup, that's where the Blue Rose come from. I think the idea that the 1956 girl says Blue Rose is pretty strong. "Blue roses are often portrayed in literature and art as symbols of love, prosperity, or immortality." I find it odd just how few people are talking about the blue rose revelation. To me, this is a huge plot develop, and very exciting! In the original twin peaks, major Briggs approaches Coop and says "have you ever heard of project blue book?" Well, yes he has - he's part of a top secret task force to investigate bluebook related cases! Even Cooper didn't reveal this to Briggs. Yet, all along our beloved Coop has been part of a secret UFO-related task force. I use the term UFO broadly as I imagine UFOs in Twin Peaks are not necessarily flying saucer/ alien related, but lodge/spirit related. A massive plot development! Why are people focussing so much on Audrey's marriage arrangements and that silly French chick? 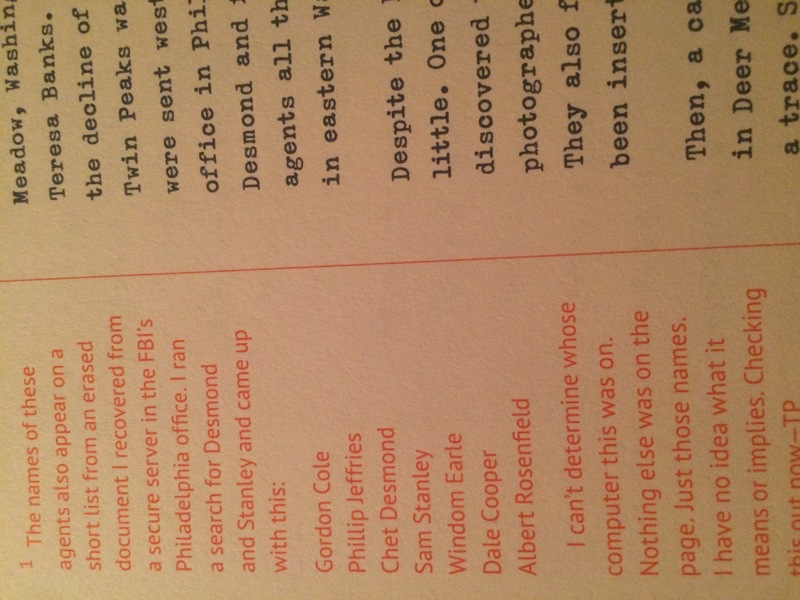 By the way, didn't anyone find it interesting that Windom Earle, Coop's former mentor and part of the blue book project, wasn't a member of the blue rose team? At least that confirms the dossier was analysed by TP prior to the events of this series. Does this list specifically state that these names are part of Blue Rose?